Emerging as a top contender in 2012, Stevie Stone is here to let fans know why he is the “Perfect Stranger” in his latest music video from Rollin’ Stone. Gritty to its roots, “Perfect Stranger” finds Stevie Stone in stripped down cavernous surroundings and lets the music speak for itself. Joined by Tech N9ne, Kutt Calhoun, and Team Stone, Stevie Stone channels his inner stranger and holds one up high for the Snake and Bat. 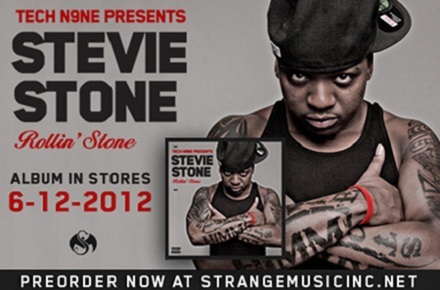 Let the Strange Music flag fly and watch Stevie Stone as he gives back to the fans that have embraced him in Strangeland. What was your favorite Strange Music cameo?